We are a legal "Airbnb", with a 96% Five Star Rating! Maintained Super Host Status every quarter! 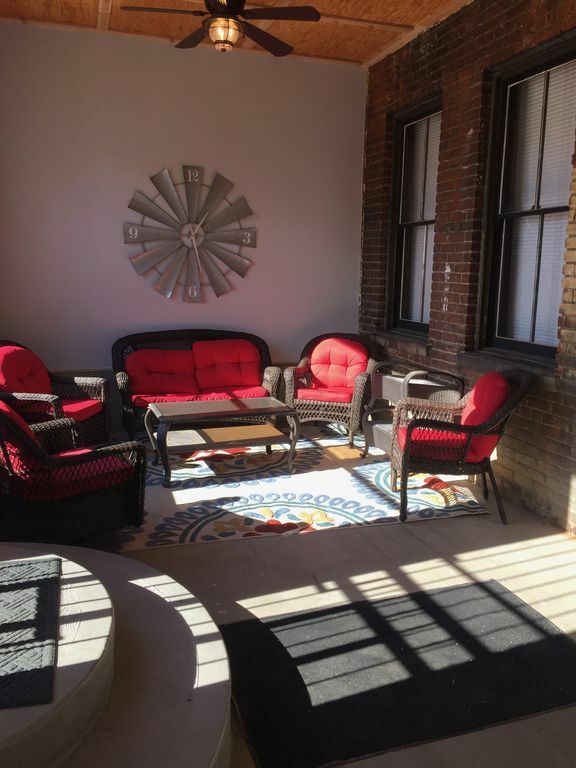 Our new studio apartment in our little boutique hotel, is 3 blocks to the Northern Kentucky riverfront (Newport on the Levee), or a 20 minute walk to downtown Cincinnati/ REDS games. Surrounded by great restaurants, nightlife, and, family activities. Close to aquarium, stadiums, shopping. You’ll love the ambiance, the outdoors space, the lively neighborhood, the people! It will all give you a historic perspective of this quaint town! A large screened porch with comfy furniture and eating area. We are always a phone call away, but we are often at our boutique, Urban Chick (part of the building), and we live only 5 minutes away. As a guest, receive 20% off all purchases at Urban Chick Boutique! We concentrate on cleanliness, great beds and great bathrooms. As well as extraordinary service! Do Historic Newport right and experience all this little town with the big city has to offer. From nightlife to museums and cultural destinations to world-class eateries and sporting events, there won’t be a dull moment during your stay with us. FREE BIKES - MUST BE RESERVED AHEAD OF TIME. PRIVATE LOT WITH FREE PARKING!!! This unit receives one spot only! Our Innkeepers, Terri Smith and Jeff Zemanek had a vision to create a small boutique hotel allowing guest to experience the best of Historic Newport. This 300 sqft Studio has a kitchenette, new Serta Queen IComfort bed and a large bathroom with walk-in shower. Located just a few blocks from the Ohio River, we are located right in the heart of the historic district in a beautiful turn of the century building. If you would also like to experience the big city, a walk or carriage ride to downtown Cincinnati creates a whole new dimension. The end result is a luxurious stay, which combines the best of both worlds.... and free parking!!! This unit recieves one parking spot! We offer free private parking and shopping discounts at Urban Chick Boutique, located in the same building. We also have bikes that you are welcome to use. It's a beautiful walking neighborhood with many things to do and enjoy. if you love beautiful homes and buildings built in the 1850's to 1920, this is the place to take in the architecture from this wonderful era. Free - Private Parking Lot located at 634 Orchard Street. This unit gets one space only! 42" HDTV Smart TV - Cable or Stream! Available upon booking request, so they are reserved and ready for you. Screened Porch for extra living space! Please let us know of any special occasion we can help with!! The property was perfect! The hosts were so hospitable, we even had snacks waiting on us! The Inn was so clean and cozy!! We will definitely be back! We loved it so much! Thanks for making our anniversary the best ever! Dosha, thank you so much! We are glad we could be a small part of it!! The room was very clean and the owners were very helpful and informative. I would definitely recommend and would love to stay here again if we are back in this area. So cute, exposed brick, great bathroom and very clean! Thank you Shannon for staying with us! We are glad you liked it! Please come back again! Thank you for staying with us and Happy Holidays!! Thank you for the kind words and for staying with us! We do hope you return for another visit! This was such a cozy place to stay with a five minute walk to the levee, coffee shops, breakfast places, and the cute boutique on the other side of the inn! Also Jeff and Terry were great hosts and throuroghly answered my questions, walked my through the check in on the phone, left a ton of snacks and drinks, and overall provided a very comfy and CLEAN place to stay. This was also very affordable! I would definitely recommend staying here! Thank you so much for staying with us and the great review! We really appreciate both! We are close to restaurants, concerts, shopping and sporting events. Terri loves walking to the farmers market, shopping in the antique stores, and of course bourbon! Jeff loves all of the music venues within walking distance. We also enjoy walking the "East Row" and enjoying the 19th century architecture of the beautiful homes.